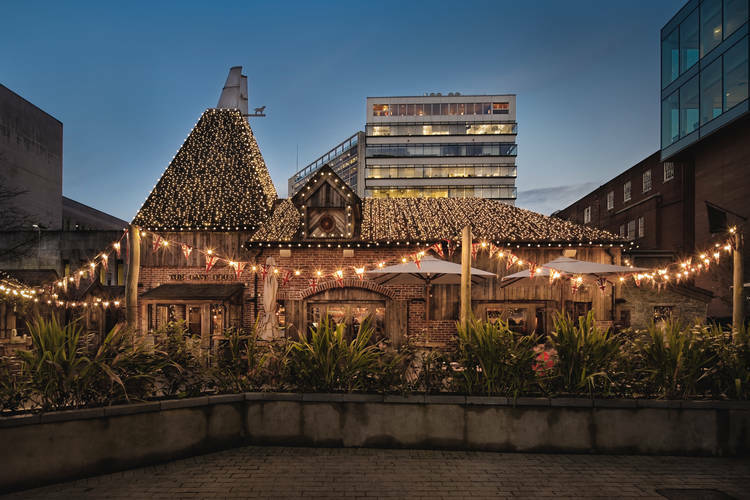 When The Oast House first opened in Spinningfields I wasn’t convinced, says CityLife. Landing like a steampunk tin space rocket in the middle of a futuristic high-rise corporate zone, the pub looked incongruous, forced. But I was wrong and over almost a year, city centrists have taken this reconstruction of a Kentish building originally used to dry hops to their collective hearts. Our own little bit of Hobbiton was the vision of Tim Bacon and his Living Ventures company, whose empire also includes nearby Alchemist and Australasia. He is now planning Oast Houses in several other locations, happy that concept is a winner. And on our balmy weekday evening, The Oast House was packed with a very varied slice of civilised Mancunia, from scenesters to office workers and shoppers in between. The doors to its twee covered terrace were thrown open and the tables outside already soaked with spills of real ale and rosé, those without a seat perching wherever they could. The Oast House takes its drinks seriously with good real ales on handpull, including Phoenix Arizona and Thornbridge Jaipur, and decent wines by the glass. I love the colourful bottled beer ‘almanac’, which explains The Oast House’s seasonal summer selection, from the mundane (Peroni and Sol) to the laudable (Proper job and Wreckless) and the unusual (Argentina’s Quilmes and Sweden’s Briska cider). Bartendering is cool, quick and assured and obviously knowledgable, as you can also book 90-minute ale tasting sessions to get an insight into the range. But we were here to eat as well as sup and for a quick bite or a boisterous dinner with friends, it is a good bet, with shared platters being especially popular. Many of the meals are prepared in a classy barbecue shack, which reflects the grill-heavy menu. I reckon the hanging kebabs of The Oast House are becoming as popular as the hanging naans of Eastzeast. My companion’s version (£9.95) was filled with juicy chunks of chicken on a dangling metal skewer. It came with crisp chips (our waiter helpfully telling us not to order them as an extra – my wallet likes that!) and a decadent pot of liquid garlic butter balancing on the top of the hanger. Yes, it’s a gimmick but a fun one. Summer had brought out the salad lad in me but more avocado would have helped in my avocado, bacon and Colston Basset Stilton salad, though there were great knuckle-sized nuggets of bacon and cheese. Service was crisp but our mains arrived at different times which was odd when mine was a salad. But we were too busy people watching to care.